What divestment does do is make people feel good. That they’re “doing something”, without having to do the thing that they actually need to do: use much less fossil fuel. It’s like a room full of chain smokers advocating tobacco divestment. This is a reasonable complaint, or at least it would be if having individual people decide to use less fossil fuel could actually cure global warming in the time that physics allows us. But it can’t, because the problem is structural: given that the fossil fuel industry is allowed to pour carbon into the atmosphere for free, they have a huge incentive to keep us on the current path. And since they’re the richest industry on earth, they have the means as well as the motive. (Chevron, for instance, offered the largest corporate campaign contribution post-Citizens United two weeks before the last federal election). If we’re going to do anything about carbon, we’re going to have to break the power of the fossil fuel industry first, which is why divestment from high-profile places is so important (just as it was in the South Africa fight). Nelson Mandela journeyed to the University of California shortly after his release to thank students and faculty there, and by extension at 155 other campuses, for pressing the case so effectively. companies and governments had identified reserves of these fuels at least four times larger than could safely be burned if global warming is to be kept to a tolerable level. That means if society wants to limit the risks to future generations, it must find the discipline to leave the vast majority of these valuable fuels in the ground, the report said. So, demonstrating the exact opposite of that discipline, Shell yesterday filed for the right to become the first big driller in the Alaskan Arctic. It’s actually a followup to their first attempt a couple of years ago, which went tragicomically wrong when a drilling rig ran aground in a storm. But forget the myriad local dangers. 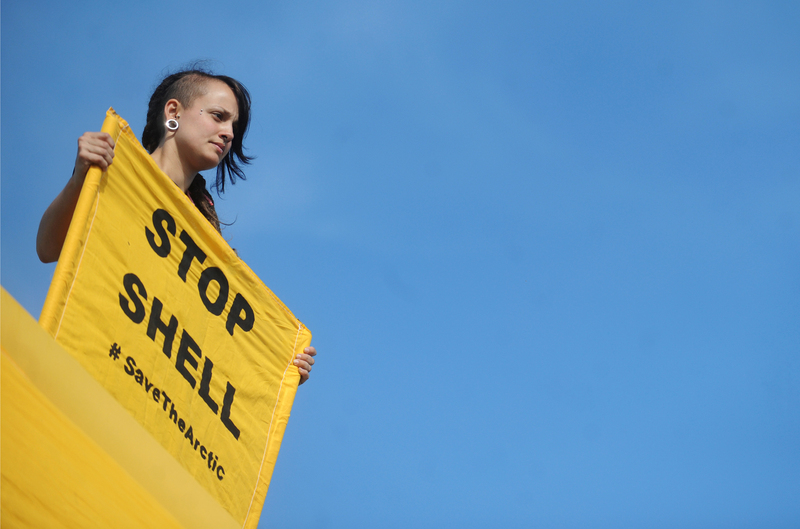 The real story is, the world already has four times more hydrocarbons than they can use, but Shell (and its brethren) are busy searching for more. This is like nuclear overkill, except that they’re planning to sell every bit of the oil they find. It’s business as usual, and it’s insane–and anyone who invests in it, make no mistake, is profiting from the wrecking of the planet. All a game, with the only planet we’ve got hanging in the balance. Oh, and Chevron, with its mighty campaign warchest? Check out this new piece from Rolling Stone if you’d like to see how they play. (Rough).